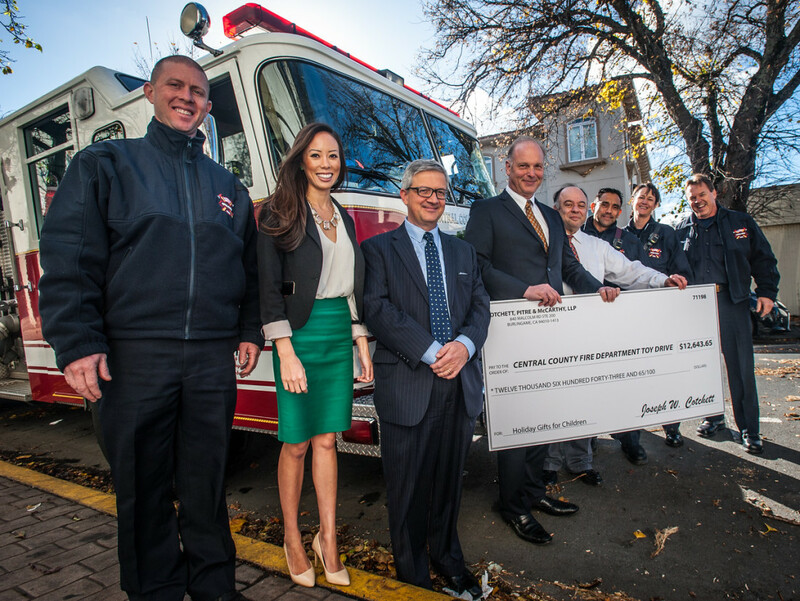 Today, John Kevranian of Nuts For Candy & Toys (“Nuts for Candy”) in Burlingame and Cotchett, Pitre, and McCarthy, LLP (“CPM”) presented checks totaling $25,287.30 to the Marine Toys for Tots Foundation and the Central County Fire Department (CCFD) Toy Drive – just in time for the organizations to purchase Christmas gifts for children this holiday season. United States District Judge Richard Seeborg of the Northern District of California granted the law firm’s motion on Wednesday to have residual settlement funds from the In re: Webkinz Antitrust Litigation case distributed to the two local charities. In re: Webkinz Antitrust Litigation, spearheaded by CPM partner Steven N. Williams, was a class action lawsuit brought on behalf of injured consumers such as plaintiff Nuts for Candy. After distribution of class action proceeds to members of the class, $12,643.65 in residual funds remained – as did the question of where these funds should most appropriately be allocated. The legal doctrine of cy pres allows residual settlement funds to be dispersed to charitable trusts that are closely related to the original intention of the settlement, opening the door for Nuts for Candy and CPM to seek the court’s approval of naming Toys for Tots and the CCFD Toy Drive as beneficiaries. The primary goal of Toys for Tots is to deliver – through a new toy at Christmastime – a message of hope to less fortunate youngsters that will assist them in becoming responsible, productive, and patriotic citizens. Toys for Tots maintains a nationwide presence, though the donated money will provide gifts for children in the counties of San Francisco, San Mateo, and Marin. Similarly, the CCFD Toy Drive seeks each year to make a difference in the community by sharing a special gift with a child in San Mateo County.